You may recall that my new (to me) van, Alice, had a previous incarnation as a State Farm mobile office. 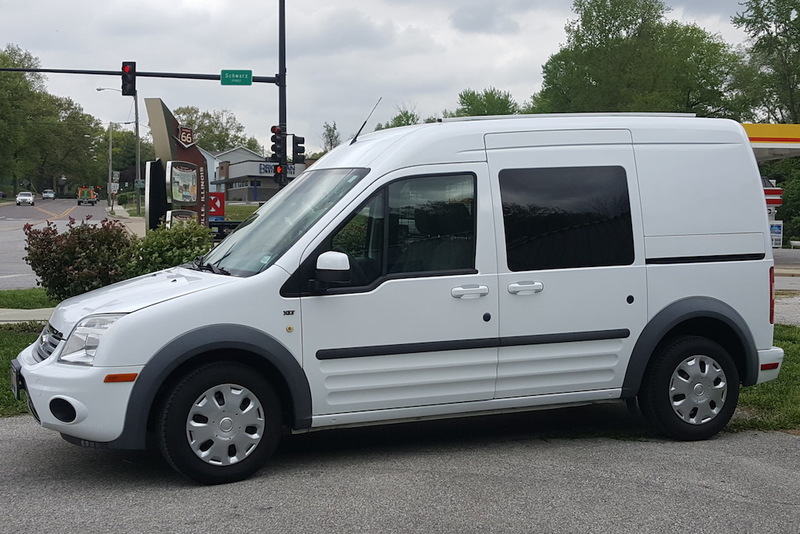 She came home with me from DeSoto, Missouri, still equipped with a very large ladder rack on the roof and a heavy desk and attached office chair wedged crosswise in the cargo area. So that I could get to work cleaning, measuring, and planning the interior, (and also so that my neighbors could quit wondering about my new hobby of buying white vans with ladder racks), I was anxious to get the equipment off and out of the van. Alice looks spiffier after the rack removal and a trip to the car wash.
Steve Rensberry and his son Ben to the rescue! Last week they arrived one evening armed with a step ladder and tool boxes. 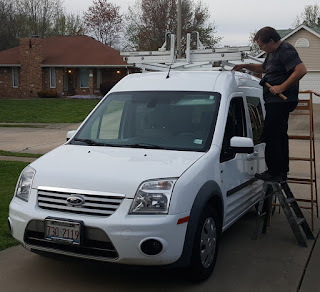 After ascertaining that the ladder rack was bolted to the rack rails and so could be removed leaving the rails intact (and not needing to plug holes in the roof), father and son went to work. 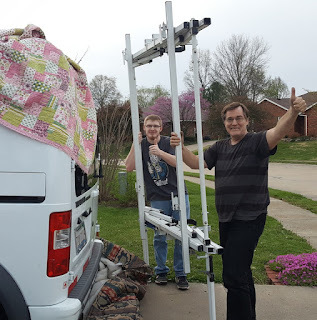 Steve removed the bolts and together on ladders they were able to slide the rack on a furniture quilt toward the rear of the van and then lift it off. 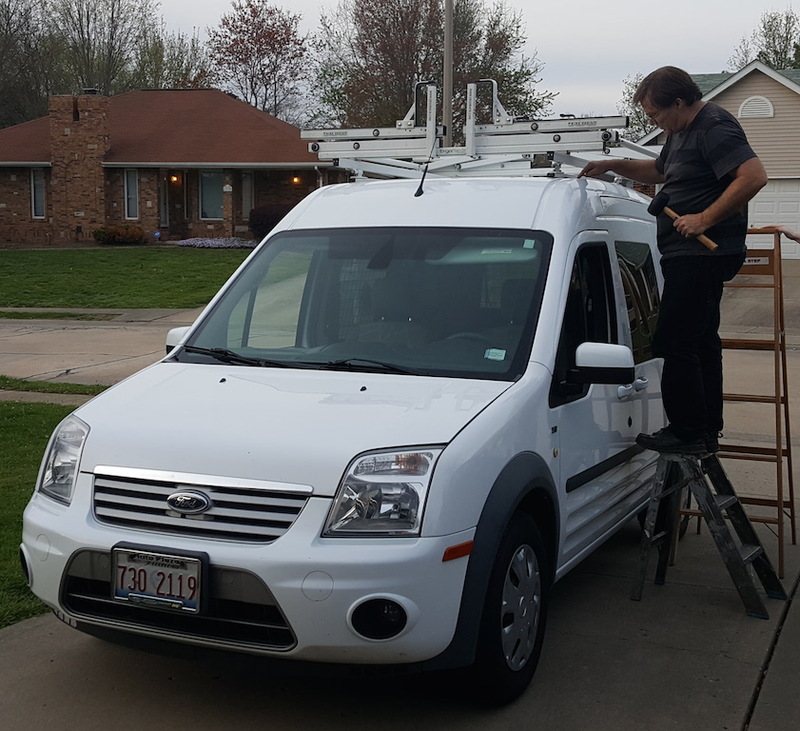 Steve unbolted the big ladder rack from the rack rails. Success! Steve and Ben removed the rack. Then it was on to the desk and office chair. 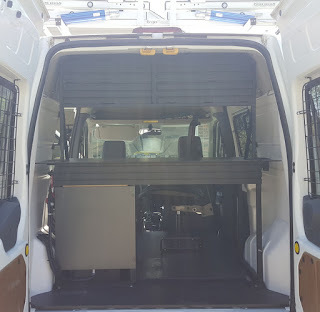 Being the know-it-all that I am, I had convinced myself that once the menfolk unbolted the desk and chair from the floor, the metal plate under the chair would slide out from under the rest of the metal plate under the desk. 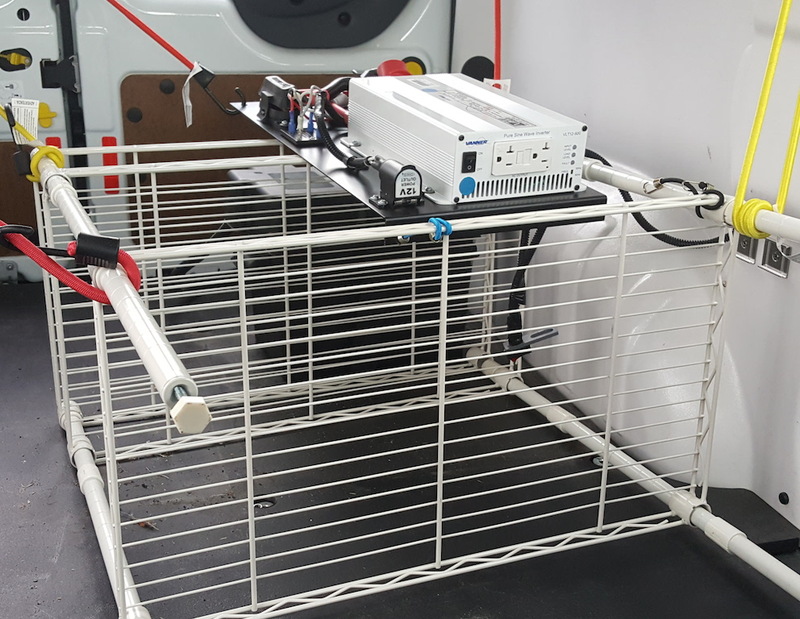 I couldn't see how the contraption would have gone into the van and, more importantly, how it was going to come out. No such luck. 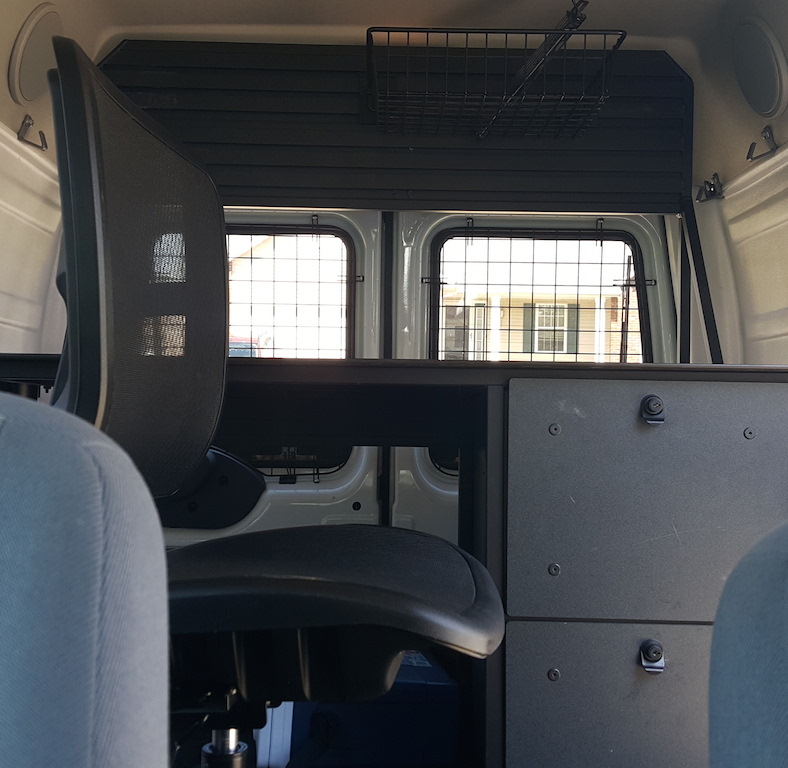 The office setup filled the back of the van. Inverter, battery, switches, wiring all got fastened securely until they get mounted on a small cabinet. By then, it was dark, the menfolk were tired, and Steve suggested he remove the grills from the windows another day. But I suggested they stay for a while. I haven't decided for sure if I want to keep them or not. 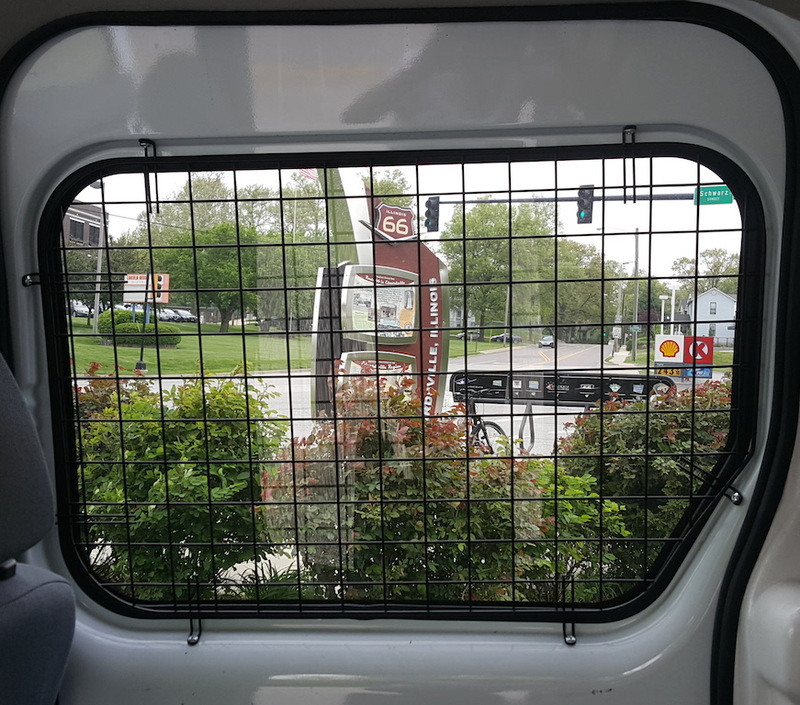 They might be handy to hang things on, plus make me look very secure in the van! 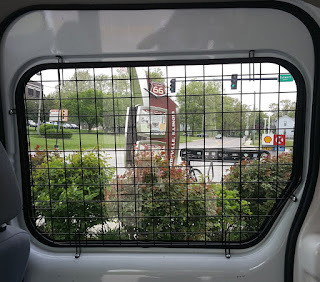 Here's a view of our Edwardsville Illinois Route 66 Experience Hub! I'm happy to report that Alice came through her surgery just fine and suffered nothing more than a few holes in the false floor where bolts were removed. Next project to get ready for Route 66 road trips--exterior decoration!